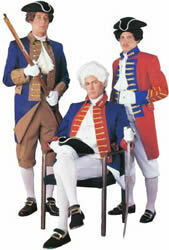 Rental Costume includes: This is a circa 1776 uniform of American Independence. The traditional buff and blue jacket in gabardine with tan lapels, cuffs and pocket flaps, trimmed with brass buttons. This uniform comes with a matching tan vest and knickers as well as colonial full sleeved shirt, jabot (neck piece), stockings, shoe buckles and tricorn hat. The colonial wig, gun and gloves shown do not come with the costume. Rental Costume includes: This uniform is the typical British soldier of the 18th century. It consistes of a red gabardine coat with a blue collar, lapels and cuffs, trimmed in gold and brass buttons. It includes a white vest, white trousers, stockings, shoe buckles, a tricorn hat, white full sleeved colonial shirt and jabot (neck piece). The wig and gloves shown in the photo are not included in the rental.